Hot off the presses! 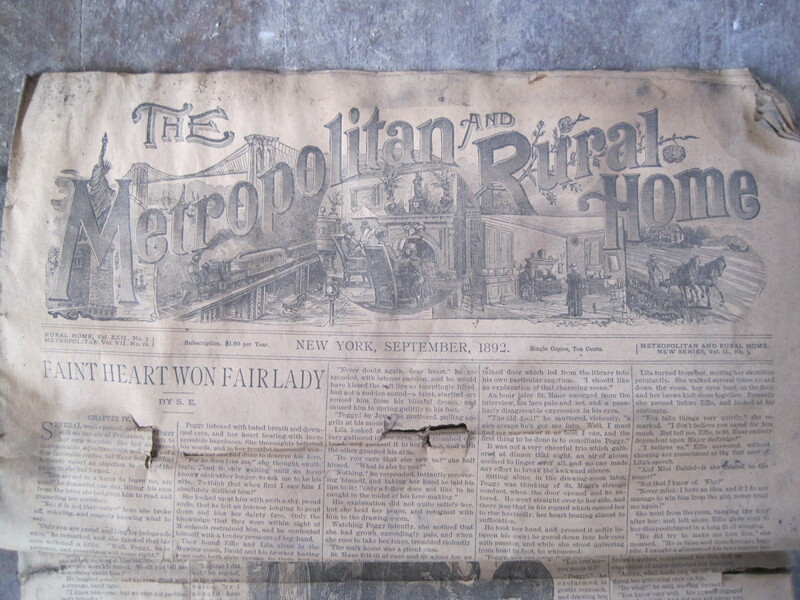 Get the latest issue of The Metropolitan And Rural Home, September 1892. Single issue 10 cents, subscription $1.00 per yer. This month get the latest installment of Faint Heart Won Fair Lady, Chapter IV. Will Peggy, the ward of Major Seftridge, have to silently endure the anguish of unrequited love for Aubyn St. Maur? Will Lila dash her hopes and steal his heart? On a more sober note, read the latest news on Horticulture, Agriculture, Stock, Poultry and the Veterinary Sciences. 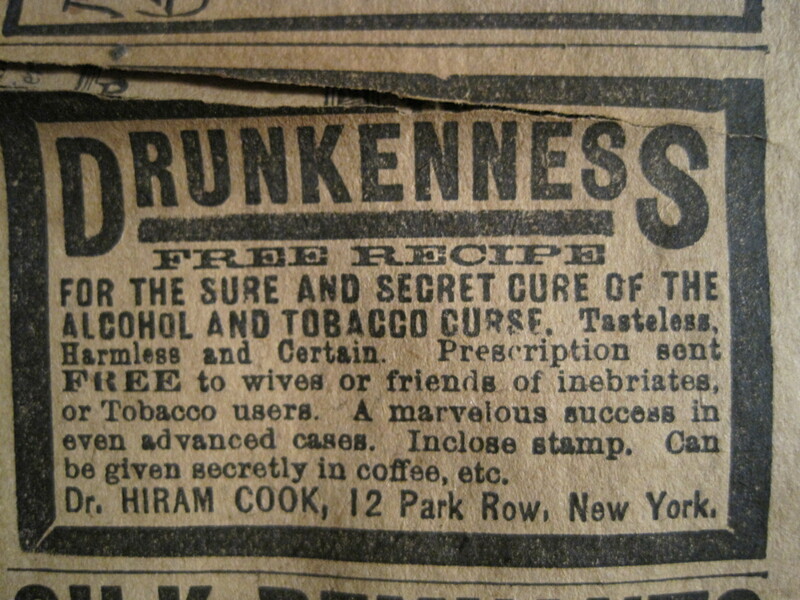 Cure for the demon drink. The latest Stock news tells us the United States has 16,019,591 ‘Milch’ Cows, with a value of $350,000,000. Mr. P.C. Reynolds asks “how much would the value of the progeny of the stock be increased if no other than pure blooded males, from a long line of high-blooded ancestors, were to be used in the future?” If Mr. Reynolds could see into the future 120 years, he would learn that the number of dairy cows decreased by almost half, to just over 9,000,000 head. Combine asbestos with tobacco – what could be wrong with that?!? However, the milk production of these cows increased six fold. Thus, with little more than half the herd, the U.S. now produces three times more milk. Mr. Reynolds would have be pleased to see that genetics played a part, accounting for 36% of this gain in production. The remainder of the the gain is attributed to a combination of nutrition and management. The ‘horibles’ – positively dangerous! 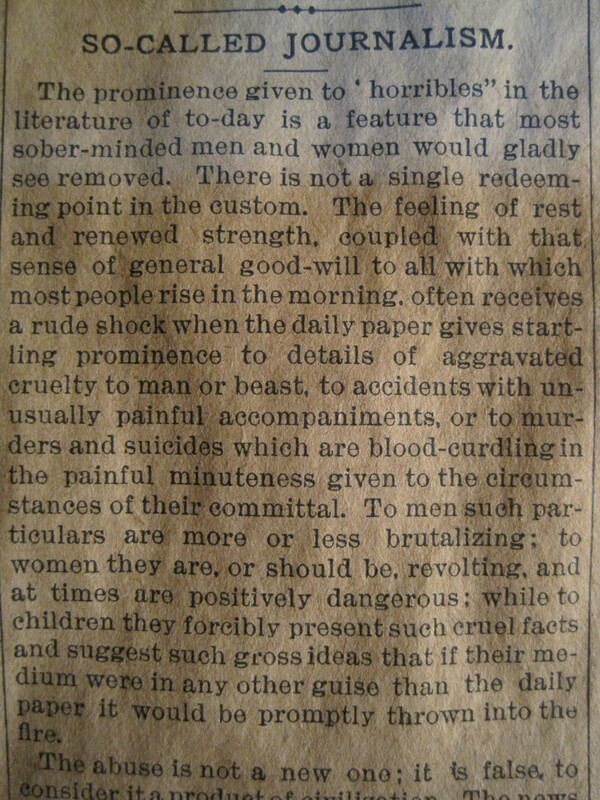 This month’s issue also addresses So Called Journalism, decrying “[T]he prominence given to “horribles” in the literature of today,” being “a feature that most sober-minded men and women would gladly see removed.” “The feeling of rest and renewed strength, coupled with that sense of general good-will to all with which most people rise in the morning, often receives a rude shock when the daily paper gives startling prominence to details of aggravated cruelty to man or beast, to accidents with unusually painful accompaniments, or to murders and suicides which are blood-curdling in the painful minuteness of their committal. To men such particulars are more or less brutalizing; to women they are, or should be, revolting, and at times, are positively dangerous… .” (emphasis added 2012). The latest in scientific cures. We are sure that no further sampling of this latest issue of The Metropolitan and Rural Home is required to ensure that you walk, nay, run, to your nearest purveyor of the finest literary periodicals. In closing, we would further ask that you patronize the services of our many wonderful advertisers, selling only the best devices and cures, developed with the latest advances of science. Very kewl. 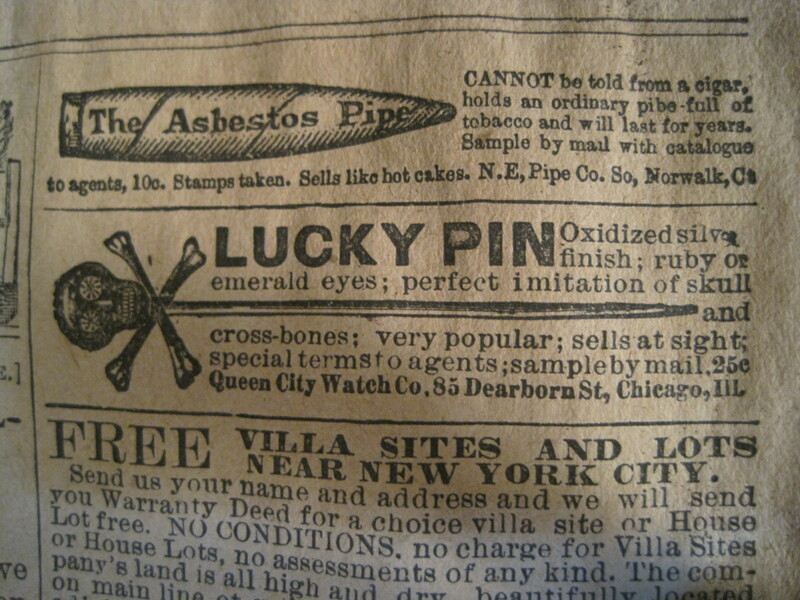 I don’t know the word for groovy in 1892. Thanks. 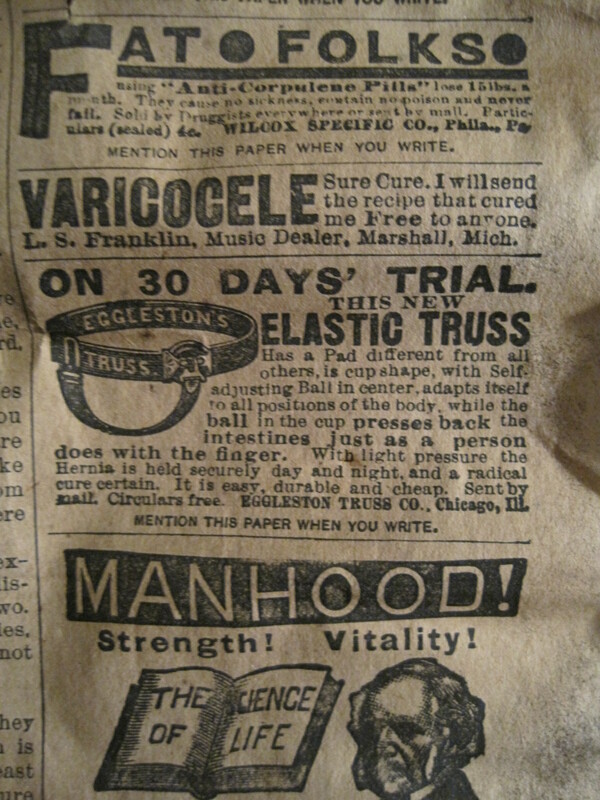 It’s funny to think what slang they would have used 130 years ago. I googled historic slang and found “A Historical Dictionary of American Slang” – but sadly nothing.